One of the harshest things that can happen to your iPhone/iPad/iPod Touch is that one fine day it turns up blank and won’t boot up. And you don’t have a recent backup of the photos, contacts, messages and more. At this point, you either let go and do a full restore (to an old backup) or you turn to recovery software’s. That’s where iSkysoft iPhone Data Recovery comes in. The folks behind iSkysoft produce some amazing software that focuses on data recovery and video downloads. One of their software’s, the iSkysoft iPhone Data Recovery, is a savior when your iDevice won’t boot up and you need to recover data urgently. iSkysoft iPhone Data Recovery is very much like many other data recovery software’s for the iPhone/iPad: you connect your iDevice to the computer, run the recovery software and voila! Most of your data is recovered and depending on your preferences, it can be restored back to the iPhone, saved to your PC etc. A few years ago, data recovery was a nightmare. Without the right tools, it continues to be a nightmare even today. And to think that the iPhone can go kaput anytime – especially if you are dealing with a lot of apps, a lot of data and a lot of usage – is actually pretty scary. That’s why Apple’s backup system is designed to make sure your iPhone is backed up every time you connect it to your Mac. 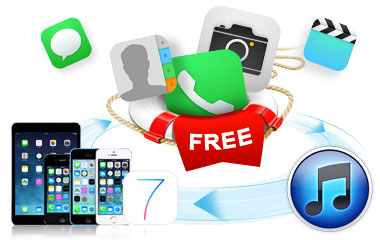 In those times of distress, a software like iSkysoft iPhone Data Recovery can be a total boon. The best thing about iSkysoft iPhone Data Recovery is that it’s pretty easy and simple to use. Most of the work is done by the software automatically once you connect the iDevice to your PC and run the software. iSkysoft iPhone Data Recovery scans your iPhone/iPad/iPod Touch (irrespective of whether it boots up or not) and tries to piece together all the data that it could recover. You can then take that data and save it on your Mac or use it to restore the iPhone/iPad directly. iSkysoft iPhone Data Recovery works great for selective backups too. For instance, you want only a few files from a recent iTunes backup – there’s no way to do but use a software like iSkysoft. The core function for which iSkysoft iPhone Data Recovery is well-known is recovering data that is lost, accidentally deleted. This happens quite a lot when you are clearing things out, or when you try one of those iCloud syncs. Lost photos, contacts, messages: all of these are traceable on the iPhone/iPad or any iOS device. iSkysoft employs its intelligence to recover these lost pieces of data and recover them as much as possible. iSkysoft Free iPhone Data Recovery for Windows can be downloaded from HERE. Thanks to Becky from iSkysoft who let me know about this freebie given by the company. Remember this freebie is running only for 3 days i.e Jan 14th, 2014 – Jan 17th, 2014.